SUGAR, CHOCOLATE CHIP, M&M & OATMEAL RAISIN. MINIMUM OF 1 DOZEN. NO CHARGE FOR TEXT! SUGAR,or CHOCOLATE CHIP. MINIMUM OF 2 DOZEN. NO CHARGE FOR TEXT! Thank you again for the quick turn-around and I promise to keep Veronica’s at the top of my list whenever I need wonderful tasty treats!" "Thank you so much for the terrific job you did on our branded cookies. The way you printed the logo was exactly what we envisioned. The cookies were a HIT at our campaign launch event for look and taste. My only regret is that we didn't order dozens more. I will definitely do that next time!" Thanks again!" "Veronica's Treats makes us feel like our company has our own personal bakery. We began using them 6 years ago to make logo cookies for a component in our clients' holiday gift baskets, and not only were the cookies a great hit, but it was such a rare pleasure dealing with Hillary and her team, that the next year we had them do the entire gift. 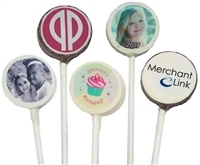 Everything that they create is so delicious (we actually have clients who start requesting the logo brownies by October of every year) and the end result so unique, that since then we have teamed with them to design all of our promotional products, and for the last few years 80% of my personal gifts as well. It always starts with, "So I was thinking…" and ends with a huge smile on the face of a happy client or friend. Though we are based in NY and they are in MA, it would never occur to us to go to anyone else!" "I want to convey to you my personal appreciation for the excellent job you’ve done for Chartis. The cookies are perfect, and I am very happy. You were true to your word, and you made it happen for us. The turnaround was truly spectacular. I know you and your staff worked diligently patiently, and most professionally to deliver this quality product. To my great surprise and delight I find the cookies truly scrumptious – again, exactly as you said they’d be. Our marketing team was out making calls in Seattle and San Francisco today starting at 9 AM. They’re still out now. I’m hearing back from them that every client visited has expressed amazement at the fact that they have logo cookies in hand – this being only Day 2 of the launch of our new and colorful brand logo. You have made quite an impression here in the west and, judging from the number of cookies you’ve sent this way and the fact that no more than 2 dozen were delivered to any one office, you can know that the reach is considerable. We are proud to give Veronica’s Treats cookies to our clients on this important day for us, and I am very pleased to have made your acquaintance through this campaign. It’s been very nice working with you and I hope we have occasion to repeat the effort again in the future (with more sensible lead-time, of course. No more surprises!) "
"It’s not often we get such positive feedback on our marketing efforts – but our ‘company cookies’ have been a tremendous hit! Created in the shape of dog bone and featuring our logo (SoundHound...but of course! ), we’ve been able to make a much bigger splash with current clients and new business leads by adding a special little ‘treat’ in our mailings and packages. Thanks to Veronica’s Treats for designing the perfect cookie, completing the job on time and always being reachable and responsive. Not to mention, the ‘dog biscuits’ taste great too! We’re glad we found this gem of a bakery online." "We just received the cookies and they look wonderful! And you are too kind to send us extra! You have once again made me the most popular person in the office. It’s amazing what cookies can still do to a group of adults. Thanks again for all of your hard work, it is greatly appreciated." "I’ve been meaning to email you about the cookies. You guys did such a fabulous job. They were darling, delicious, and everyone loved them. I was very pleased with how they turned out. Veronica’s Treats was wonderful to work with! Brittany was very accommodating and helpful throughout the entire process. Thank you for giving us such an outstanding price for our non-profit agency. We greatly appreciated it! I would definitely use Veronica’s Treats again, hands down! Thank you so much!"